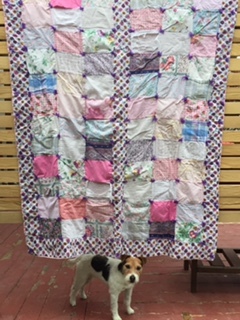 I love the looks of tied quilts but have never done one myself. 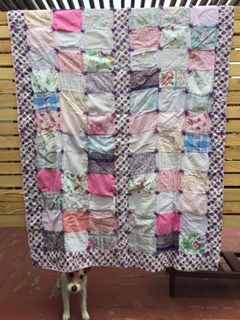 My friend made a t-shirt quilt for her daughter and then tied it, came out really nice. I found an old tied quilt at my grandparents house that desperately needs the backing replaced but I haven't had the nerve to try the repair yet. I look forward to reading what others share in your linky. This is so cute...soft and worn. 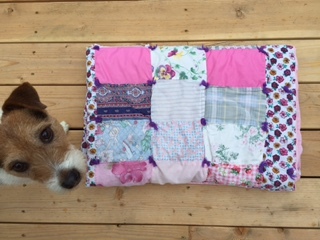 Never kept a tied quilt...only given a few away. Jackson, thank you for showing off your quilt. Tell your mom you get a tummy rub for being so cute. like you not tied a quilt was looking at one on a blog 5 mins ago and not only has she tied it but also quilted in the ditch and hand quilted it too.